Here are some small flies, they are irritant to the body. Not so much that they swirl around your head and sit on you, no they crawl into your eyes and ears. Well, when you bike fast enough, they disappear. I woke up this morning to the chilling sound of water. I have put myself next to the watercourse that delineates the site. The sky looks a LITTLE promising. Do not dare say more, the last rain drops fell half an hour ago. A Dutch cyclist arrived after me yesterday. Had planned a 4 week trip. Now he was "fed up" after a little more than 2. Believed he had seen what he wanted to see. Was disappointed with the lack of authenticity. Nothing but tourists. 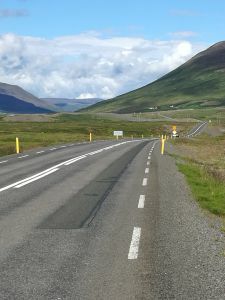 Had also been in the worst: uphill in the highlands in the headwind on a bad road. Had turned around. 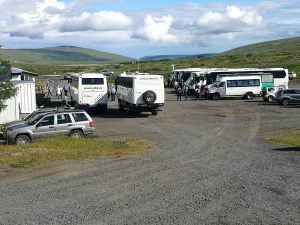 Now he had rebooked and was taking a bus from Akureyri to go home. Was probably around 60. Last came a Pole. 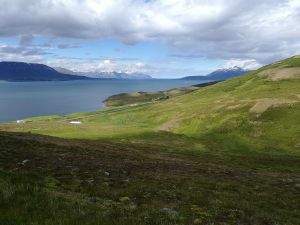 Babbled in a hard-understandable English, but I retrieved some important informations regarding the Kjölur route, by which I am heading towards Reykjavik. According to Icelandic conditions, it is quiet. Now it's just packing. A wet tent. Before I get that far, the miracle happens. The clouds are spreading and the sun is shining. The tent is getting dry and I exchange email and phone with the Dutchman. 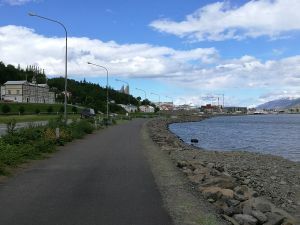 We'll have a beer together in Akureyri. The bicycle map tells of a more than 200 altitude meter increase almost midway. I've been looking for it for a long time. Now it is there, but fortunately, it falls at least in 2 stages. I take a short break after the first one. Then unfortunately it appears that there were only 2. Now comes the killer. Fortunately, there are no flies here, otherwise it's very annoying when you drive 6-7 km/h and can not escape them. Make a single stop, when I think I'm more than halfway. It is both good and evil with such a stop. When you start again afterwards, the legs die after approx. 20 threads. THEN is no time for whining. As I hoped, it was almost over after the last turn I could see. I think I was about 40 min to ride up. At 44 km/h it probably takes max. 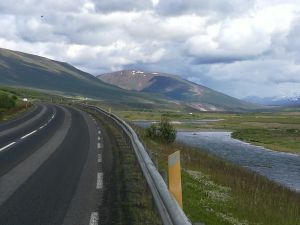 5 min to drive down, the last piece with extra speed, as I get tailwind south towards Akureyri. It's 14 degrees. I went up in a t-shirt, but have to ride in the bike jacket on the downhill - and even then it's cold. 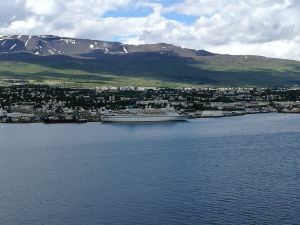 Akureyri is located at the bottom of a protective fjord. I drive the last piece on a path with benches, etc. and a scary sculpture, whether it's also for bikes, I do not know. Find tourist info and then the hostel. Reception will not open until 15, so I'm going to the supermarket, which is almost next to. Then go back and eat another lunch - and then it's open. Now at 17.30 I have got an extra gas can, an adapter, so I can use my extension with the socket for all my chargers AND have got washed. Everything obviously costs 1,000 in this country. 1.032, 995, 1.000. An ordinary Danish square socket can NOT fit the Icelandic sockets. Then you know, if you should ever get here. I'm busy updating blog. Writing the Dutchman and we agree to meet 20.15 in the central square. It must be to find, the city isn't THAT big. When we meet, he has brought an American girl, who also cycles. We only get a single beer. After Egil's 2%, a common hit hard. Even if you have only cycled 60 km.